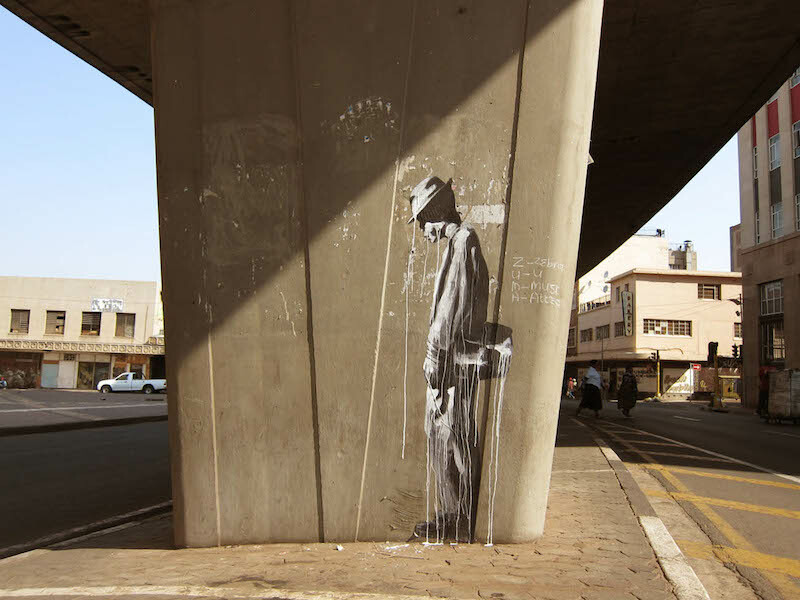 A piece by Faith47 in Johannesburg, part of her series “the long wait”. Photo by Faith47. I once spotted an example of this parallel reality on Juxtapoz’s blog. In December 2012, there was a post on their blog with the simple headline “Horfe x Spone,” and the question: “We wonder where the talents of Horfe and SPone came together?” The accompanying photograph showed two throw-ups next to each other, one by Horfe and one by SP.One, aka Greg Lamarche. The work is interesting, but the photograph provides little context for where these pieces actually exist (or existed) and the blogger provides no credits for the photograph. Even if Horfe or Lamarche come forward to explain the context, there’s no turning back now: People have seen that photograph and spread around the internet without any information about the work’s location — a piece of information which would seem to be crucial if the community believes that street art and graffiti can only truly exist within the context of a location. A blogger at Juxtapoz apparently disagreed and felt the image was worth sharing even without that information. Even though cities become full of Banksy-hunters when a new piece appears on his website, some of his work has appeared online but never discovered on the street by fans. Two Banksy pieces that were posted on his site just in time for the 2012 Olympics in London were never located, neither were the teaser image or the Staten Island video for his 2013 New York City “residency” show Better Out Than In. Those works appeared on Banksy’s website and in some sense they only exist online, even though the implied geographic location is relevant to all four of them. When street art and graffiti were first developing, location was a defining characteristic of the work. Books and magazines changed that somewhat, but get information from those sources was a slow process. With the popularity of street art and graffiti on the internet, location has become practically irrelevant. Because there is an unprecedented level of interconnectivity among all these artists even though they work in cities all over the world, Pedro Alonzo considers street art to be the first global art genre. That interconnectivity has been made possible by the internet. People report seeing work on Wooster Collective during the site’s early days which had clearly been put up in the artist’s backyard, only to be replaced a month later by a new piece in the same spot. I haven’t been able to find an example of this and Marc and Sara Schiller don’t recall it happening, but just the fact that fans of the site tell that story says something about the way blogs have changed people’s idea of location. Today, blogs and forums and social media profiles are the locations that matter, and conversations between distant artists take place online. The web is where the eyeballs street artists are trying to reach are found. In many cases, posting a photograph has become more important than the work itself, particularly among young street artists in cities without a strong street art community or artists using techniques that are best rendered in a photograph or a video. Today, Wooster Collective is a location more highly prized by street artists than nearly any street corner in the world except perhaps New York City’s Bowery and Houston mural. And while bloggers have become the new gatekeepers in a sense, artists can also reach out to their fans directly thanks to services like Instagram and Twitter. Evan Roth stated it quite bluntly: “The internet has eyeballs.” As a result, the internet has made the location of some street art and graffiti obsolete. If you don’t get a photo before your piece gets buffed, it may not matter whether it’s in a most highly visible spot in a densely populated city or an alleyway in a suburb. While it can still be helpful to get up in Brooklyn rather than Columbus, Ohio, it isn’t essential. The difference between getting up in Columbus versus San Francisco isn’t as important as it once was. Often, the most important function of the location of street art and graffiti today is to provide context for the piece, rather than eyeballs. People’s attention is online rather than on the city streets, and it’s only logical that street artists and graffiti writers go where their audience can be found. After all, an audience is exactly what so many of them are seeking. The internet is the only place where an artist in Ohio can share a photograph of a stencil he painted in an alleyway, a fan in Australia can see the piece and re-share it with her friends, and an artist in Tel Aviv can see that photo thanks to the woman in Australia and make a piece influenced by it only hours after the artist in Ohio sprayed that stencil. Location is still important for street art and graffiti, but the locations that matter don’t exist in the real world anymore. The audiences for graffiti and street are they same people they’ve always been, but they’re looking at art from their desks rather than from the sidewalk. Some artists have adapted as their works have moved from cityscape to screenscape, and that’s what the next two chapters will highlight.